Tactical Holster. Rails & Covers. Tactical Vest. Tactical Belts. Tactical Clothing. Bottle Pouches. Tactical Battle Aluminum Mugs with Handle Sight. Bicycle Tail Bag. Tactical Battle Aluminum Mugs with Handle Sight. Color: Black. Material: 6061 Aluminum made CNC Process Anodic Oxidation. Size：5cm X 7.5cm. Rifle Sling. Tactical Holster. Rails & Covers. Tactical Vest. Tactical Belts. Tactical Clothing. Survival Whistle. Bottle Pouches. 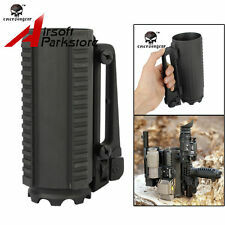 610ML Tactical Military Battle Mug Multifunction Beer Mug Aluminum Water Cup. Tactical Holster. Tactical Vest. Tactical Belts. Tactical Clothing. Utility Pouch. Bottle Pouches. Tactical Battle Aluminum Mugs with Handle Sight. Tactical Remote Swtich. Forest Tiger. Tactical Battle Aluminum Mugs with Handle Sight. Tactical Flashlight. tactical flashlight w/battery. Tactical Clothing. Hunting Accessory. Mini Pocket Torch.